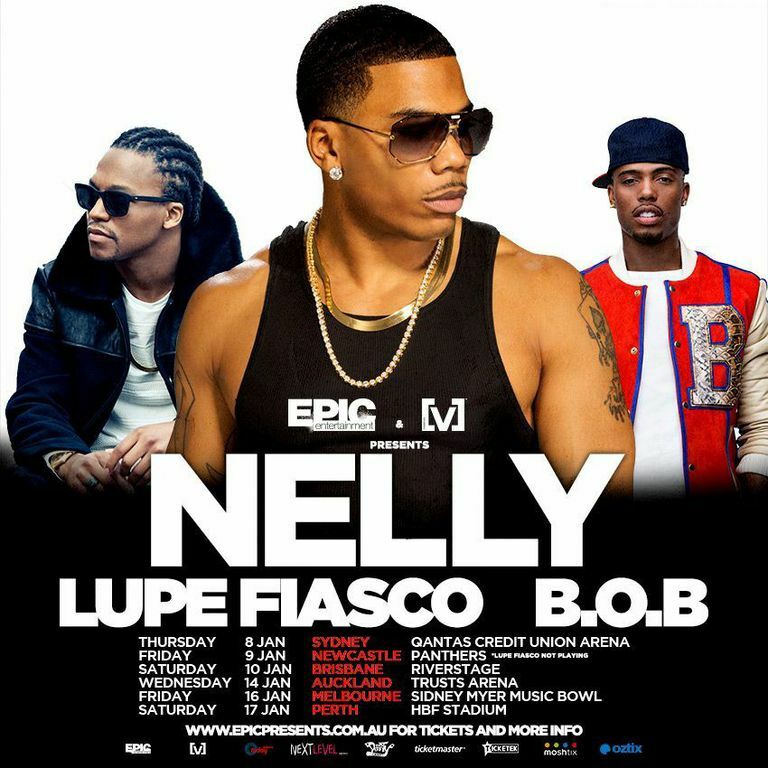 Epic Entertainment today announced that double Grammy award-winning rapper Nelly will be touring Australia and New Zealand early next year and will be joined by Lupe Fiasco and B.o.B for the ultimate hip hop concert. Pre-sale tickets for which are on sale now. With over 21 million albums sold, the tour marks Nelly’s first visit to Australia in 4 years, and first ever arena tour. Joined by Lupe Fiasco and B.o.B, the trio will kick off the tour on January 8 in Sydney, finishing up in Perth on January 17, playing at a variety of stadiums and arenas nationally. Since jumping on the scene with his infectious debut single, ‘Country Grammar’, Nelly has made a resounding impact in music that can still be felt to this day. Most recently, the multi-platinum, Grammy award–winning rap superstar released his seventh full-length album, M.O., featuring guest appearances by Nicki Minaj, Pharrell, Future, T.I. and 2 Chainz. However, his talent goes beyond music, expanding his brand into other arenas, including acting, fashion, his own line of energy drinks and two television shows including a reality show about his life. Grammy award winning hip hop/rap artist, Lupe Fiasco joins the powerhouse trio on tour. Since blasting onto the scene in 1999, Lupe can be credited for global hits including ‘Superstar’ and ‘Battle Scars’, whist racking up an impressive 12 Grammy nominations and countless other awards. Breaking musical barriers, B.o.B redefines the term rapper with an impressive blend of lyrics, vocals and memorable hits; including one of 2012’s biggest hits ‘So Good’, which dominated the charts globally. He has collaborations with some of the biggest names in music, including Chris Brown, Taylor Swift, Nicki Minaj, Lil Wayne, Eminem, Bruno Mars and even our very own Potbelleez.